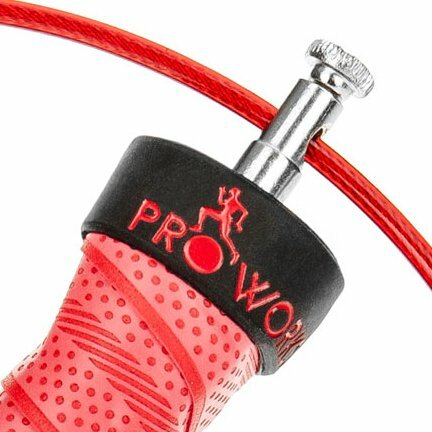 A FASTER, SMOOTHER JUMP ROPE EXPERIENCE: With its premium quality connectors, lightning fast, tangle-free cord and easy-adjust design; Proworks speed skipping ropes are built to deliver the best possible jump routine. For CrossFit, boxing, and more; whatever your fitness goals, this high performance rope is designed to help you get there. MAXIMISES RPM: Engineered for maximum speed and control; the cable and handle connections feature a high quality stainless steel ball bearing, ensuring an ultra-rapid, super-smooth rotation. It’s just the rope you need for double and triple-unders, criss-crossing and competitive freestyle jump rope tricks. EASY TO ADJUST: The 3m (approx. 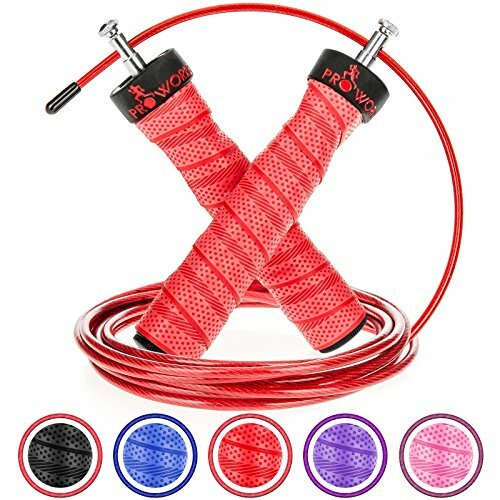 10ft) long skipping rope can be adjusted quickly and easily to suit the height and bodyweight of the adult or child user (up to a maximum user height of 2m / 6ft 6in tall). 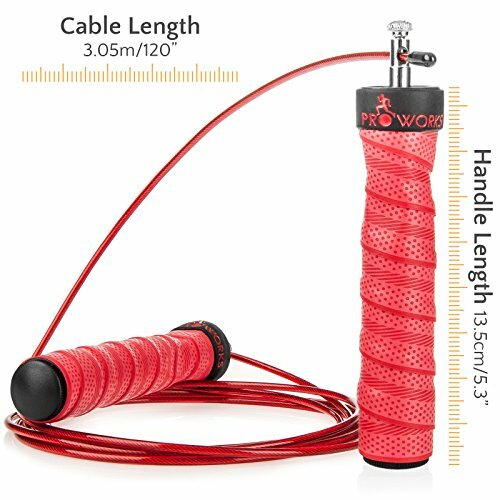 Supercharge your workout with this durable skipping rope from Proworks. 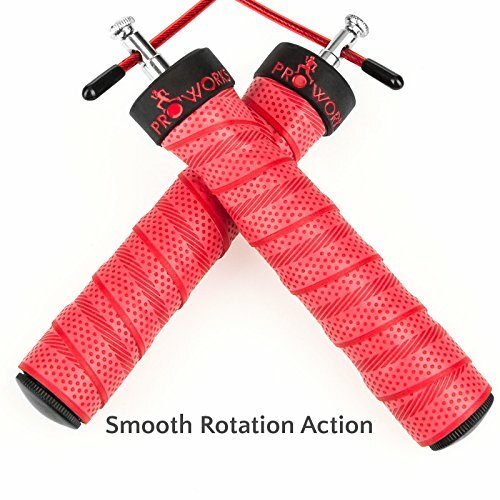 From traditional boxing, Thai kick and shadow boxing foot work and other martial arts through to running, gymnastics, squat training, and bodybuilding; whether you’re a professional or exercise novice looking to burn belly fat in the gym or home – whatever your training goal – this premium sport rope deserves a place on your essential kit list. 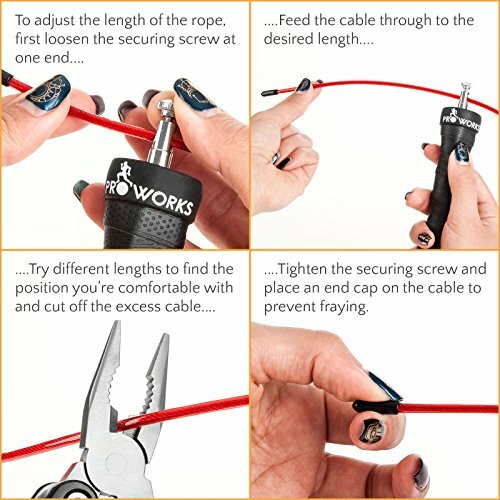 With small, secure adjusting screws at each end, you can set the length of the rope to match your height. Try different lengths to find the size you’re comfortable with. Next, cut off the excess rope then reposition the removable rubber caps to prevent fraying at the jumprope ends. 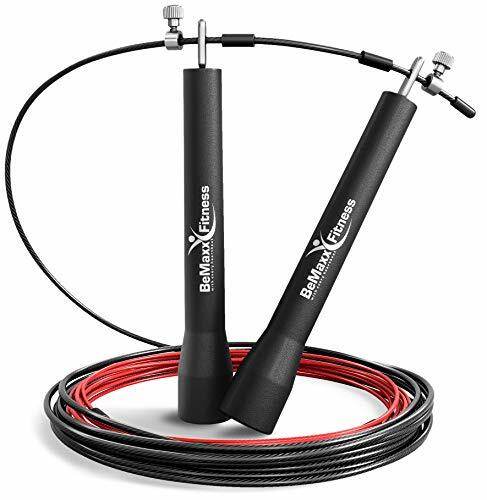 This jumping rope is built from flexible steel cable – the best material for pro boxer-style, high-speed skipping routines. A PVC coating helps shield your gym rope from wear and tear caused by solid indoor gym floors, concrete and grass. It also helps stop kinks and tangles – and cushions bare legs from whipping injuries (a big plus for beginner jumpers). The rope handles feature stainless steel bearing connections. This results in an ultra- smooth rotation to help you maintain a proper jumping arc at slow or fast speeds; vital for novice skippers to get to grips with. For more experienced athletes, this reliable build allows you to reach extra-rapid jumping speed and increased rpm, while staying in complete control. Spare Rope & Parts Included! For people new to jumping, heavy ground contact can take its toll on a skip rope. 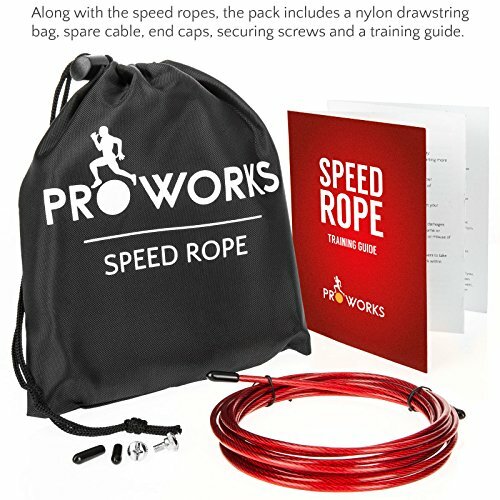 With this in mind; Proworks has included a spare rope and connectors in the box. We’ve also included a handy carry bag and skipping exercise guide; essential reading for anyone still learning the ropes! 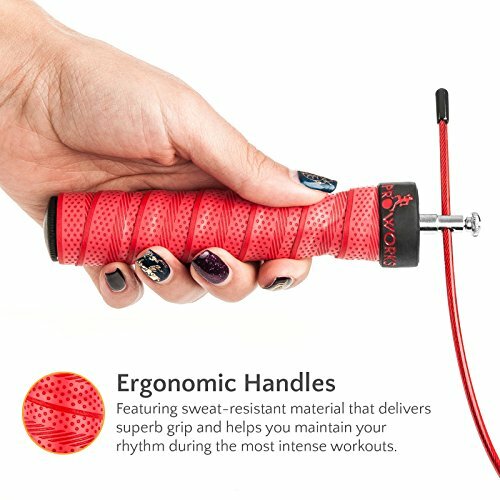 SWEAT-RESISTANT HANDLES FOR A SUPERB GRIP: Ergonomically-designed, moisture-resistant jump rope handles help you maintain your rhythm during even the most intense workouts. 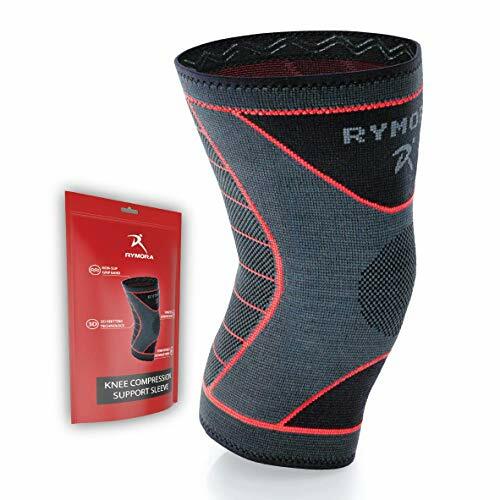 This also helps protect your wrists and shoulders from excessive pressure and strain. SPARE ROPE & EXERCISE BOOKLET INCLUDED: In the box: 1x jump rope (Rope length: 3m [approx. 10 ft]. Handle length: 14cm. Boxed weight: 340g). 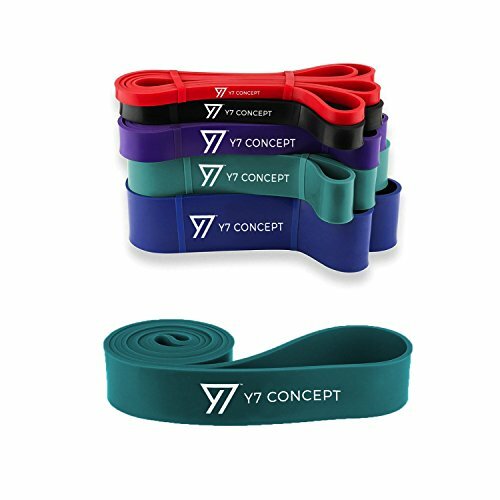 Also includes skipping exercise guide, spare cable, spare cable end caps and screws, and a nylon drawstring carry bag. 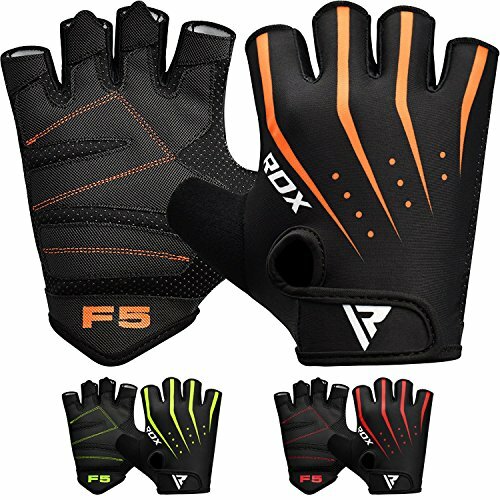 Suitable for adults and children – girls and boys, for indoor and outdoor use.